Hey all! Happy Monday! How was your weekend? Ours seem to go by in a blink these days. Friday night was my sweet, sweet grandma's birthday, and we all gathered at my cousin's place to celebrate with tacos, an impromptu dance party and lots of fun. We also were a bit obsessed with the camera, unfortunately it wasn't mine. So I'll be sure and post some pics once I get them from my mom. Saturday I spent pretty much all day working on a big exciting project for Parsimonia, and guys, I'm seriously dying to tell you what I have going on, but it will have to wait a little longer until it's almost finished. :) However, there certainly is something to celebrate right now: The Blues are headed to Round 2 of the playoffs! The game on Saturday had me on an emotional roller coaster, but we ended up beating San Jose to advance, and I could not be prouder of this team. It's been so long since we've made it past the first round, and I'm trying to keep my cool, but I think we really have a shot at the Cup this year. We just have to take it one round at a time, and next up is the team of my former home, Los Angeles. They beat Vancouver (seeded #1) in five games, so it will be no small feat. Sunday morning I was finally able to get to a couple estate sales, and one thrift store. The first one was a little picked over, but I found some goodies to bring home. The second was even more sparse, and I only left with one thing. After that, my mom and I went to a nearby Goodwill, and it was a GOOD visit! I found some stuff that still makes me squeal with glee a little. Want to see? 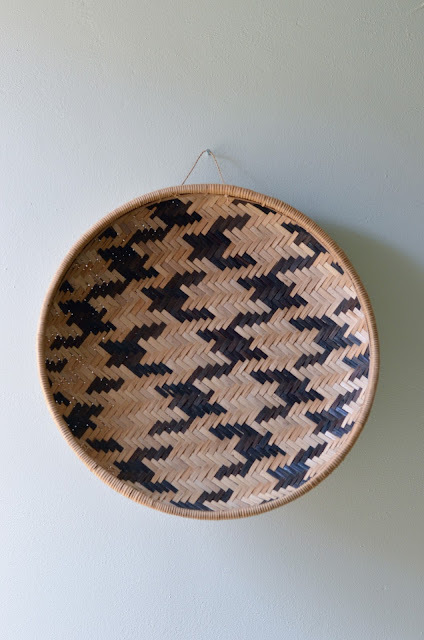 I found this handmade basket in the basement of the second sale. Will work perfectly in our dining room. Two stainless steel canisters from Goodwill. Can never have enough of these to store baking ingredients! 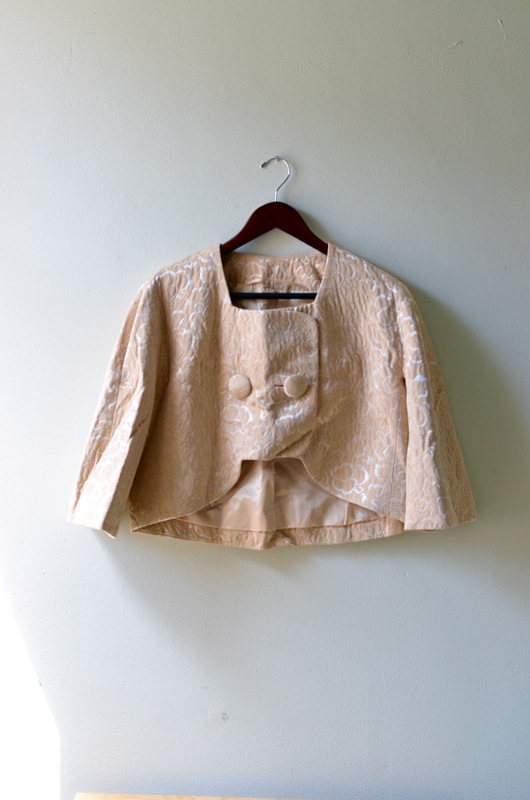 A really pretty vintage bolero jacket. Has two big buttons in the front and a shimmery tan pattern. Would looks especially cute over a vintage dress. For sale, if you're interested! 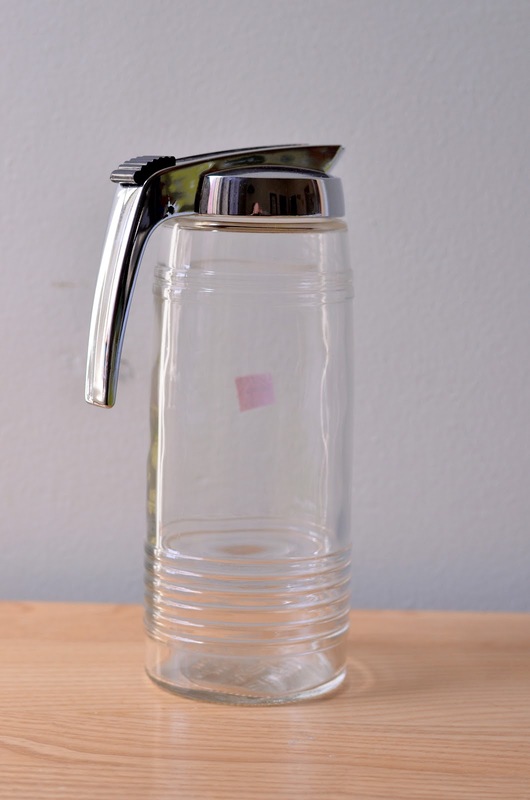 syrup dispensers (pull a knob back and a piece of stainless slides back to let you pour). will be great for some upcoming parties! Another super cute serving set, but this one is for sale. 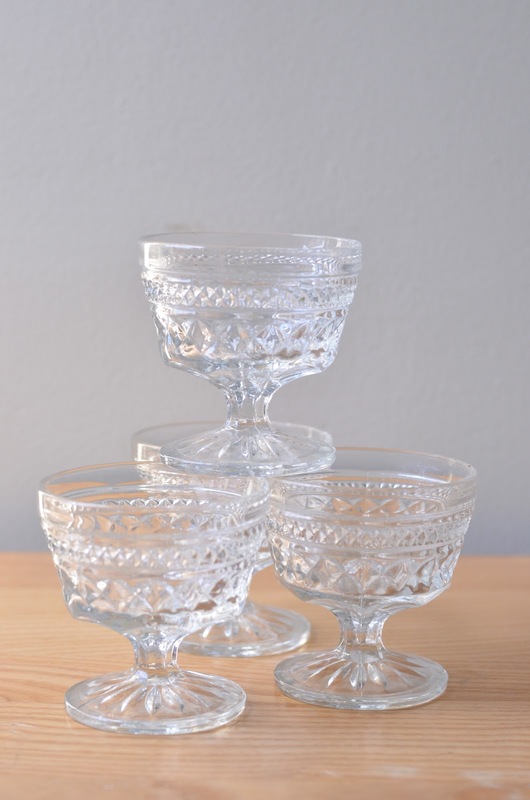 Four juice/water glasses with a pitcher and serving tray. The gold bands are in really good condition. My find of the day! A set of nine Fire King jadeite mugs, spotted on a cart at Goodwill. I think I'm going to sell a set of 4 or 6 and keep the rest. 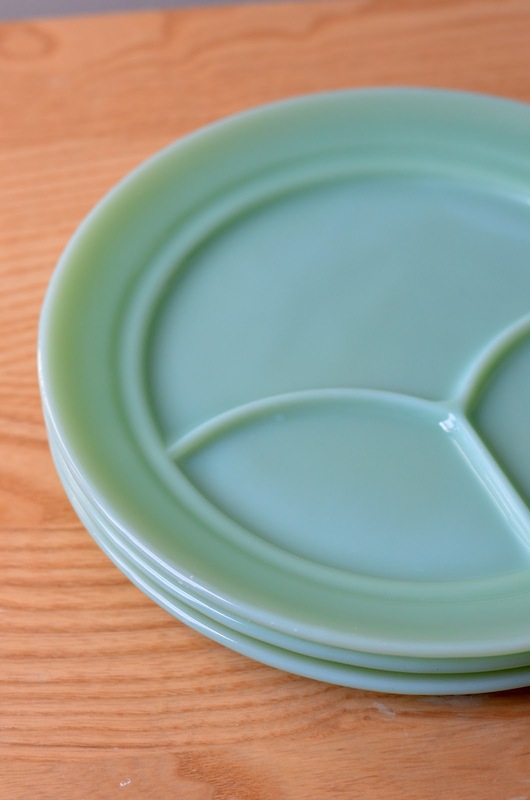 And three of the divided jadeite plates. How about you? Find anything good this weekend? Dying over your jadeite and VERY CURIOUS as to what they price that at up your way! You know, it's about the same as it is elsewhere. Jadeite is one of those things that's in such high demand, that everyone knows about it and prices it accordingly. If you're interested in any, though, shoot me an email and I'll let you know what I'm thinking of selling them for! Ohhh! Your jadeite is heavenly- something so whimsical about it! Isn't is dreamy? The color is just gorgeous. I've always loved these pieces! 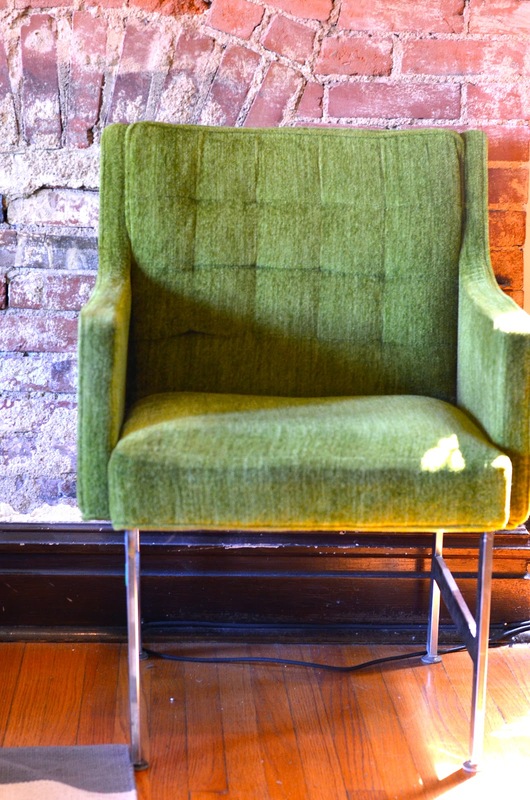 Lovely finds, and what a lovely hubby you have too for bringing you home that fab chair! So lucky on the mugs - I saw a set this weekend - $150! Love the colour. Wow, what gorgeous things you've found. Particularly like your glassware and that chair is so cool. Wow so much amazing things! Isn't it cute when husbands buy you something that they usually complain about you buying? Mine has done that too. And those Fire King mugs are amazing!!! Love the loot! Those jadeite pieces caught my eye over at Rhoda's features (congrats). Too cute that your husband has caught the thrifting bug!